Our nephew, Jorealle, is going to be 13 years old next month. Because the young lad tends to attract the ladies, he was dubbed the “Heart Throb” when he entered high school last June. Well, much to his chagrin, the young chap had something else throbbing last week. While our Filipino nephew passed on old-school circumcision, he did undergo the knife. At least his pee-pee did. Are you, particularly the males out there, scratching your behind’s wondering why in the world a 12-year-old kid is now only undergoing circumcision? It’s not considered a religious rite. Over 84% of Filipinos are reportedly Roman Catholic. The Catholic Church doesn’t require it. It’s all about “machismo.” One report states that 93% of Filipinos are circumcised. It’s a traditional right-of-passage into manhood. It amazed me several years when two nephews in Manila underwent the procedure. Both of them were in the 8-12 age range, the traditional age span for young Filipinos. The older nephew underwent the procedure “like a man” and didn’t cry one tear. However, younger brother Geo sobbed like a baby for a couple of days. At least Jorealle and his two Manila cousins had the luxury of visiting an actual medical facility and were given a local anesthetic. That wasn’t the case for Jorealle’s father, Joery, nor was it the case for my wife’s four brothers. These brave guys underwent the traditional Tulì, Filipino rite of passage for young men. Brother-in-law Joery, who was visiting our home the other day, attested to the “old-school” procedure. My wife also explained what her brothers endured. Wikipedia describes the practice almost exactly as my asawa related it to me. 1. The traditional circumcision makes use of a curved piece of wood that is anchored into the ground. 2. The protruding part of this apparatus is pointed at its end: the foreskin of the boy being circumcised is drawn over this protruding part. 3. The circumciser rests his knife lengthwise across the boy’s foreskin and then a quick blow is made with a stick, slicing the upper foreskin into two and exposing the glans. 4. Prior to and while the procedure is being performed, the boy is told to chew guava leaves. 5. The masticated guava leaves are applied onto the wound as a poultice and is bandaged. The boy is then to wash off in the cold waters of a nearby river. The only difference in the procedure between Joery and my wife’s brothers was that Joery did jump in a river afterwards. My wife’s brothers did not. However, everyone did chew on guava leaves. I believe I would have needed a shot of whiskey or something much stronger than a guava leaf. Jorealle was reportedly crying after the procedure. Can’t blame him. He’s doing better now however he’s walking around bow-legged. According to the boy’s Mom, Alida, wealthy parents have their sons circumcised as infants. Such was the case for me and I thankfully have no recollection of the procedure. Wikipedia chronicles the results of a United Nations World Health Organization, WHO, poll done in the Philippines. The boys questioned were in the 10-14 age group. Nephew Jorealle reportedly cried after the procedure but did the sobbing at home. I can’t blame him. He was suffering pain and discomfort and walking around “bow-legged.” However, he’s doing much better now. 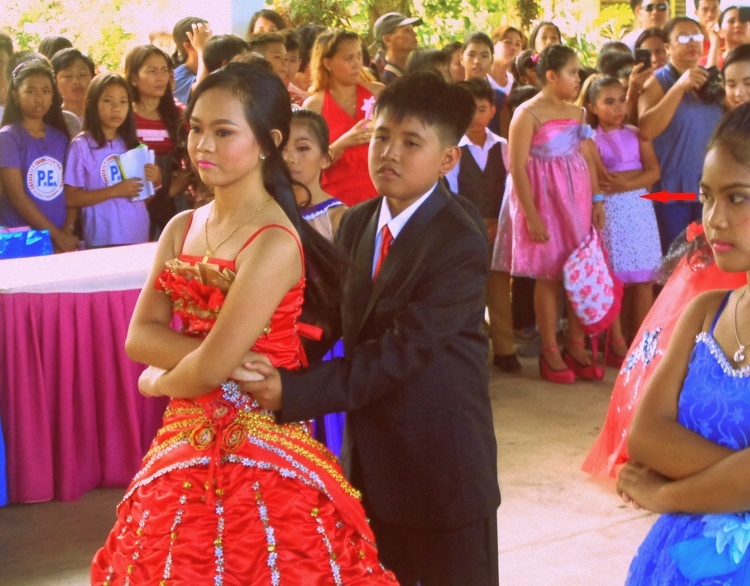 Like many young Filipinos his age, the circumcisions are done during school vacation. The boys have time to recover and don’t have to miss any school. What a way to begin summer vacation.